There is a set of four colorful 100% cotton fabric bags within the "mother" bag. Each of these four is filled with dried, all-natural lavender flowers. Lavender Dryer Bags are very practical and environmentally friendly with ALL parts being recyclable. An information sheet is included with a myriad of recycling ideas. Includes a set of 4 bags. After making sure each of the four bags is securely tied, toss ONE bag in the dryer with the wet clothes. Though the fabric has been tested for color fastness, please be careful with all white loads. Once the bag is in, START the dryer. Don't let the Lavender Dryer Bag and your clothes sit in a wet mash together. 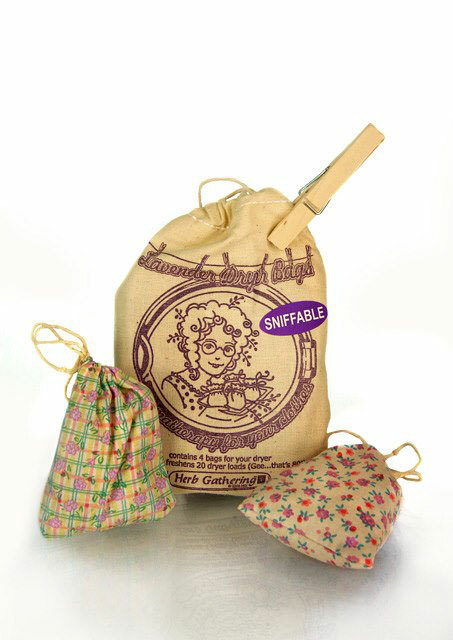 Each bag can be used over a dozen times. The dried lavender is steamed by the wet clothes, releasing a delightful fragrance that will bring a smile to your lips, a lift in your spirit, and de-stress you on washing day. Gee! soon others will be volunteering for this job.